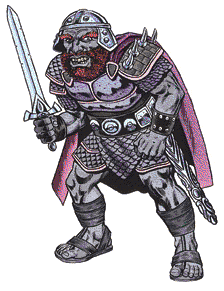 Giants have been a part of Dungeons & Dragons since the very beginning. This isn’t anything special, any fantasy mishmash needs Big People(tm). D&D has, however, thrown in multiple varieties of giant from the beginning. 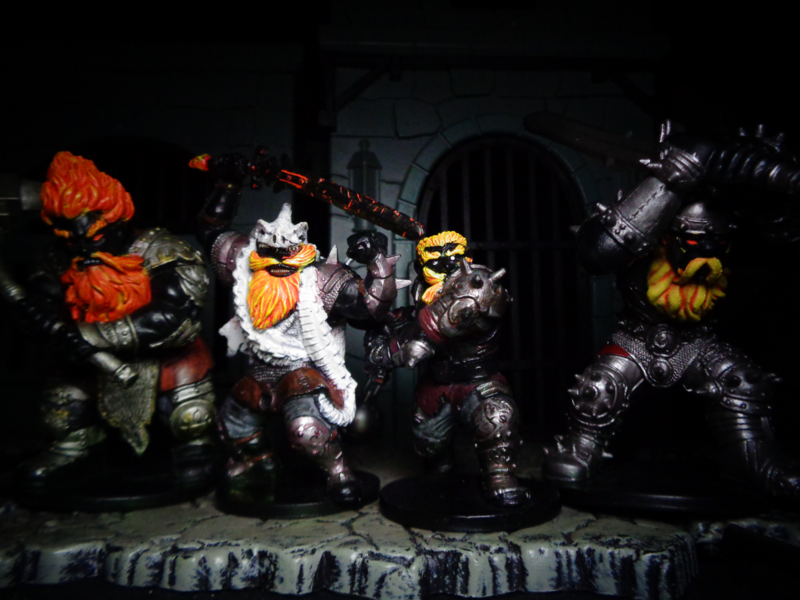 Although the number of variants is different in each edition (the longer an edition lasts, the more random stuff gets piled on), the core six types are Hill Giants (classic big cavemen giants), Fire Giants (ash-dark skin, fire-orange hair, proportioned like Dwarves, do a lot of forging), Frost Giants (gigantic blue Vikings), Stone Giants (skinny, but made of rock), Cloud Giants (extremely large, pale skin, live in the clouds), and Storm Giants (basically Zeus). 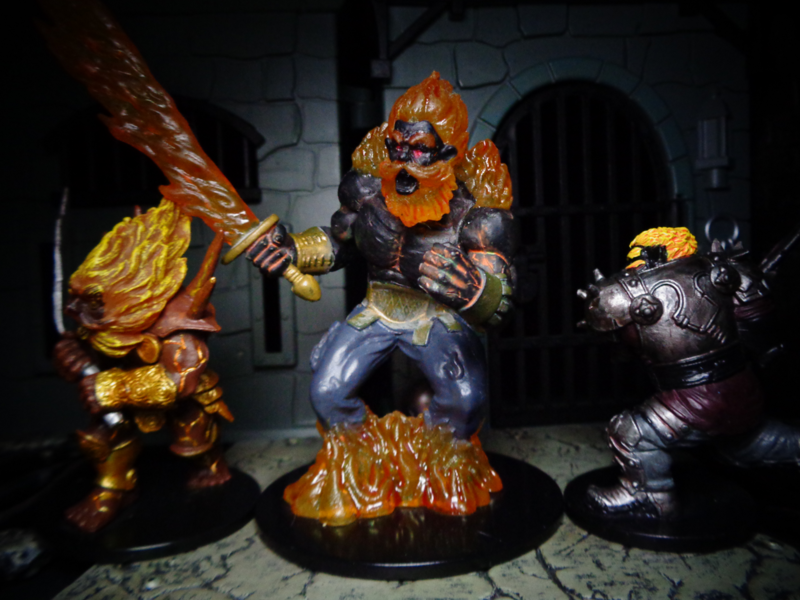 Fire Giants are based on Surtr, one of the Jotnar from Norse Mythology. hailing from the realm of Muspelheim (or perhaps just Muspel, the primeval fire), Surtr will wield his flaming sword in Ragnarok to destroy the world, eventually mutually killing and being slain by the god Freyr. Surtr’s name means “black,” in reference to the charred, burnt color of his skin. This is reflected in traditional Fire Giant coloration, as they have coal-black skin, and fiery orange hair. They are built like Dwarves, stocky and muscular, and in that way are in the same “scale” as Frost Giants, despite being shorter. 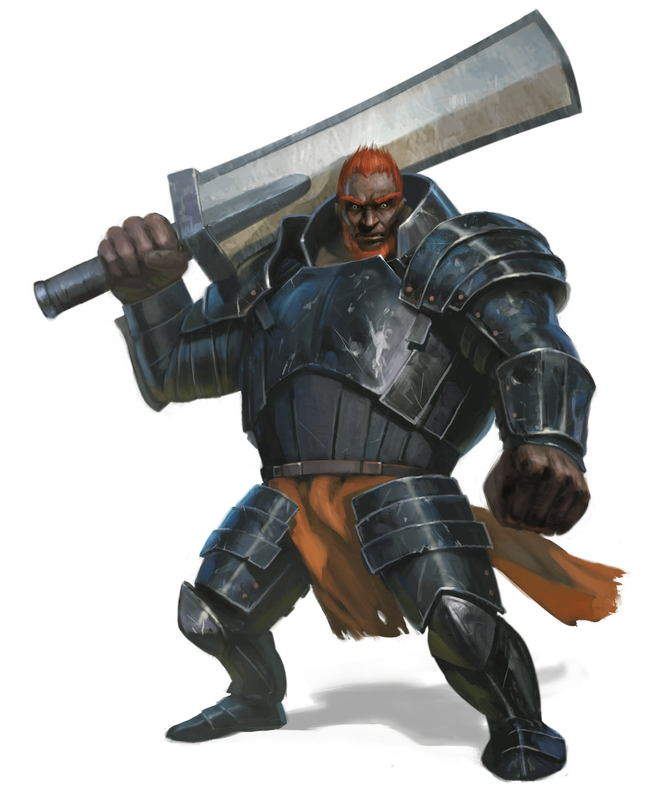 Fire Giants are primarily known for metalwork, as they are masters of the forge and warfare – a Fire Giant will typically wield masterwork metal weapons and armor, rather than clubs and stones. 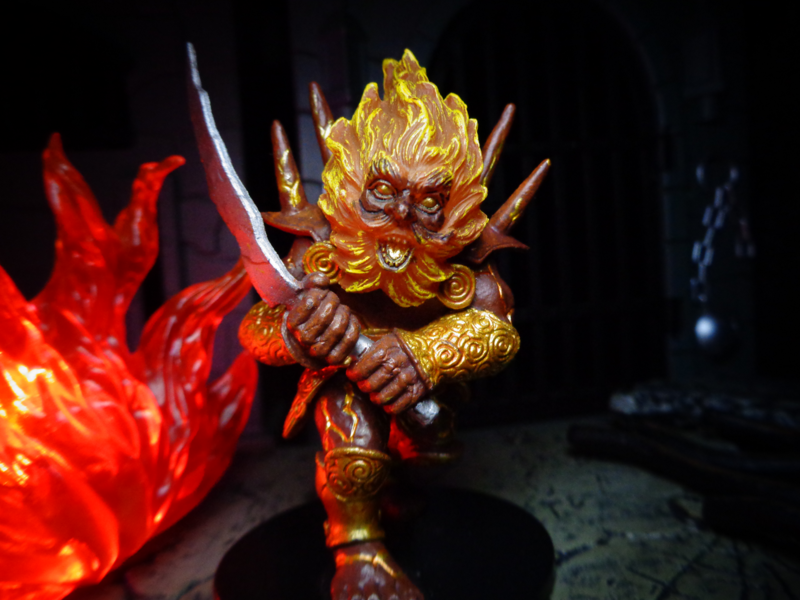 Pathfinder makes them literally fiery, and 5th Edition D&D gave them a massive overhaul in appearance. But for the most part, they have been pretty consistent. 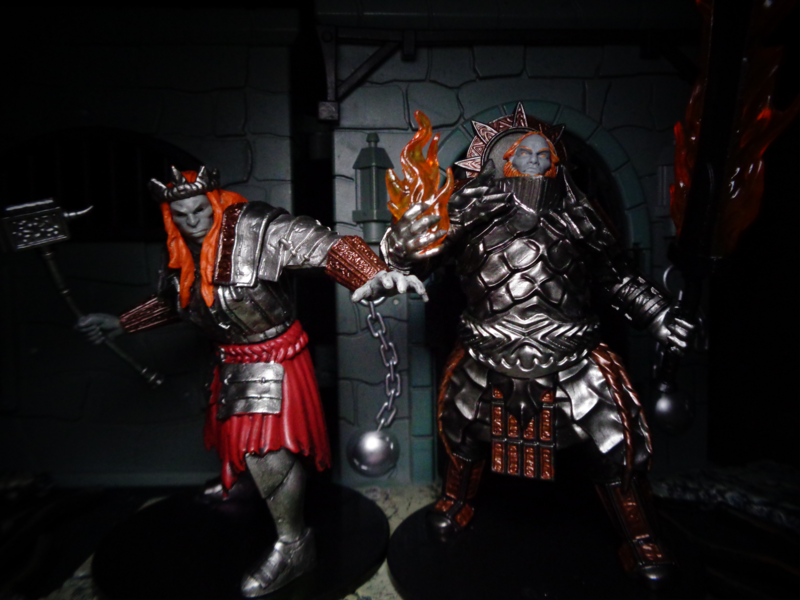 Fire Giants have changed size between editions, being “large” (at roughly 12′ tall) in older editions, and “Huge” (at roughly 20′) in 5th Edition. 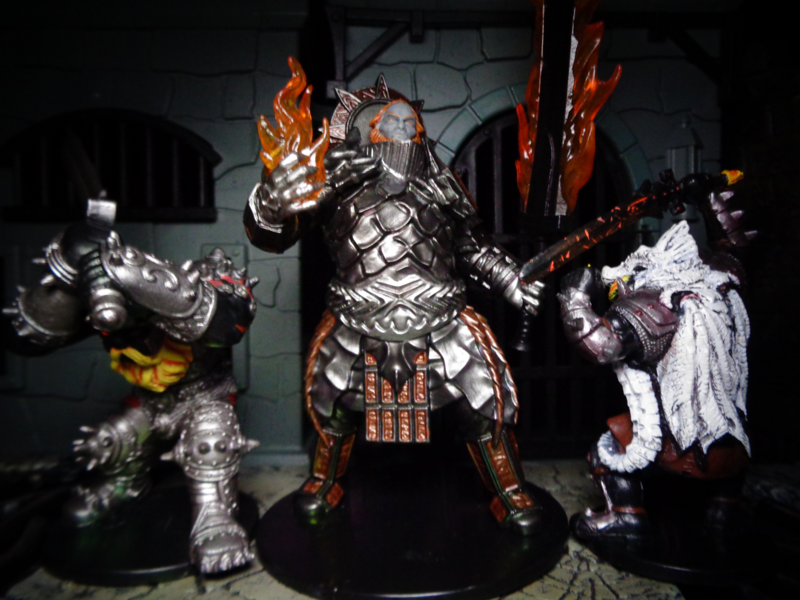 As for the miniatures, they are all in the 4″-6″ range, with the smaller Fire Giants being about 3″. You can see some comparison shots with human-sized miniatures later in the article, as well. Just keep in mind that, when interacting with other toys, they may not seem so titanic. 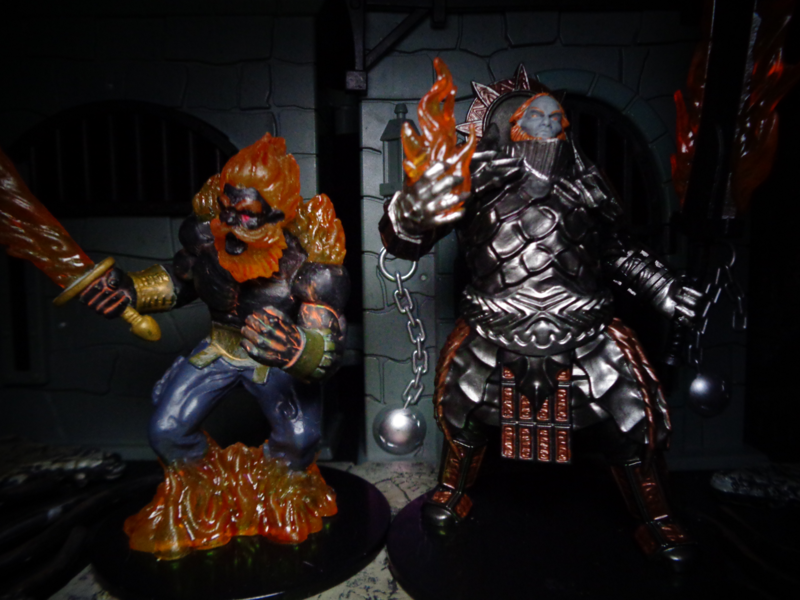 Anyway, let’s take a look at how Fire Giants have changed through the editions, and then get into the figures! 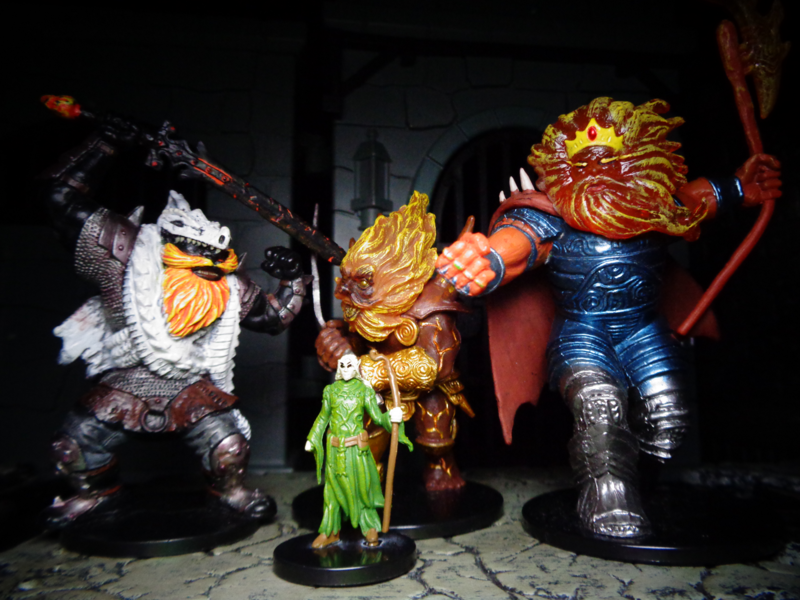 In 1st Edition, Fire Giants, uh… looked kind of stupid. As in, mental difficulties. But he’s wearing plate armor! 2nd Edition added color, and Fire Giants began to take a more obvious shape. This guy’s expression is oddly sneaky, but he has the basics down. Not the Roman-style armaments, too. 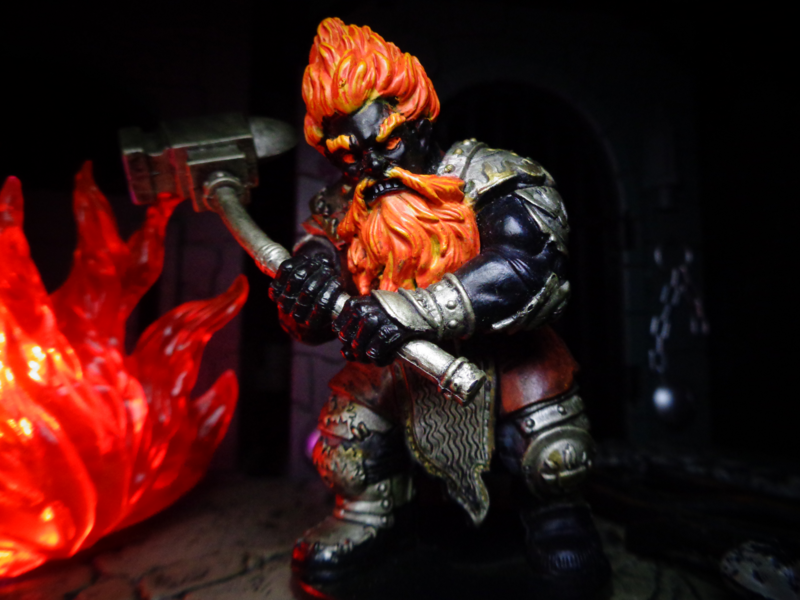 Although 3rd Edition depicts their basic Fire Giant in a tunic and not armor, the basics remain – he is proportioned like a Dwarf, despite being much larger, and has the same Surtr-esque coloration. When 4th Edition did its thing, Fire Giants gained a measure of elemental ability, but were otherwise unchanged. However, the addition of Fire Titans added a far more direct Surtr parallel. Okay, I think Fire Titans are cool. 5th Edition turned them into Ganondorf. Seriously. Fire Giant skin was lightened into a muddier, greener tone, their hair was made more subdued, their Dwarven features were changed, and they look ready to conquer Hyrule. Fire Giants had one of the most severe changes between editions, not just the size. The forge parallel still exists, though now it’s a formalized Ordning, treated with far more reverence. Well, let’s look at the figures! In 2004’s Giants of Legend set (see a trend?) we got our first Fire Giant. 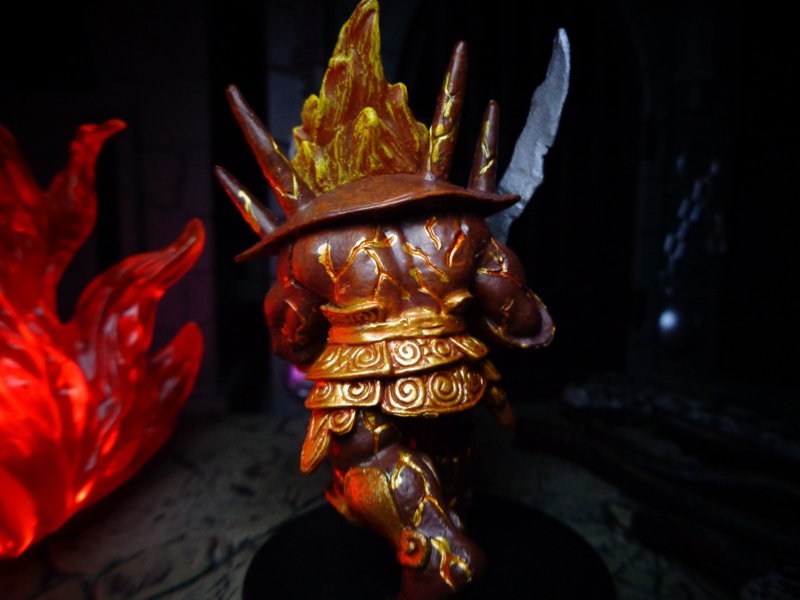 Aside from the awkward, difficult-to-photograph pose, the figure is pretty much exactly what a Fire Giant should be. 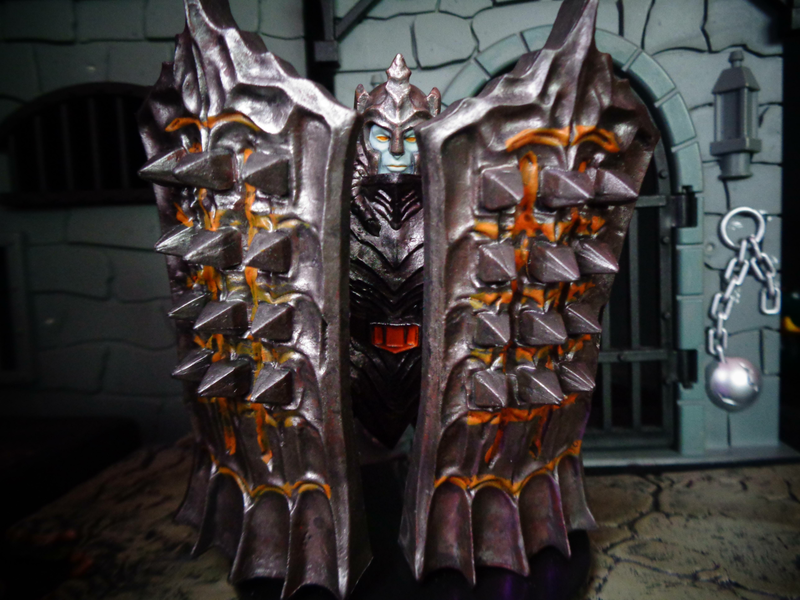 Great armor, great weapon, great size and proportions, great coloration. His pose isn’t totally awkward, but a more neutral stance would have been better, to be honest. 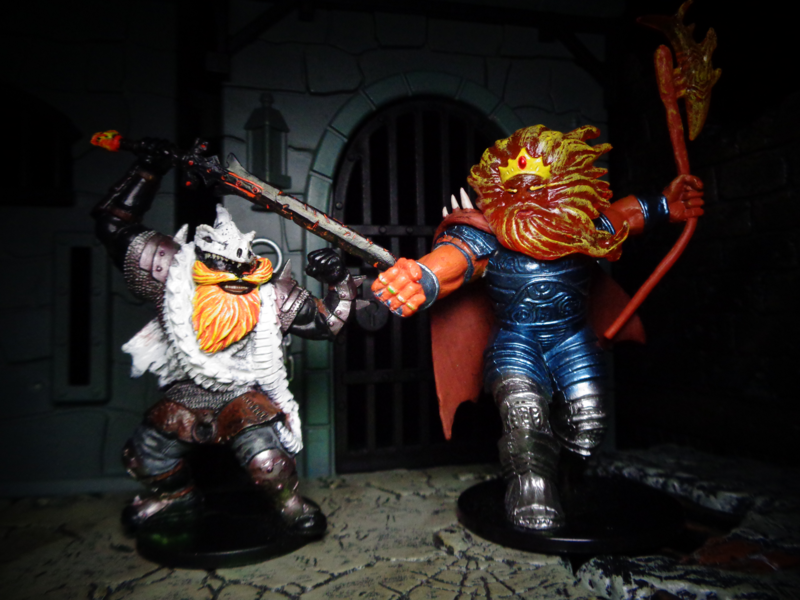 The same set also gave us King Snurre Ironbelly, a unique Fire Giant leader from the classic Agaiant the Giants adventure path in the 1970s. 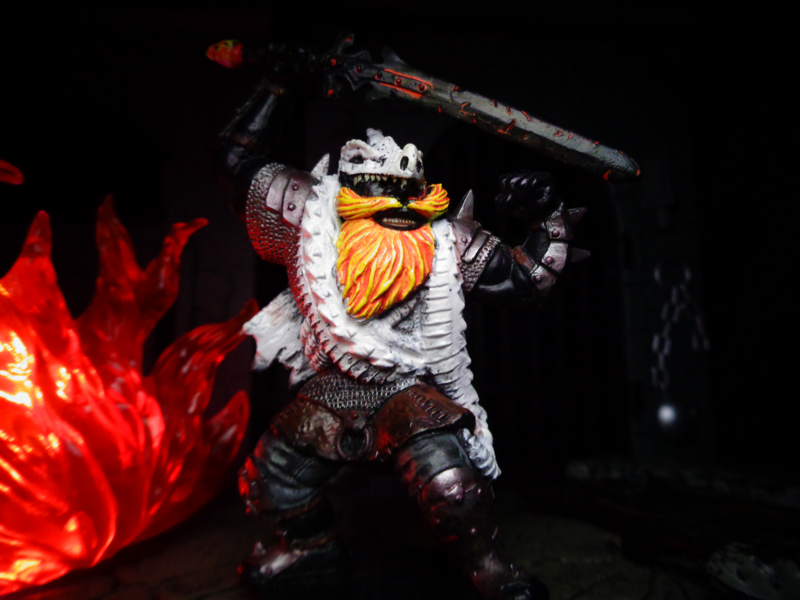 Snurre is a classic character despite his limited appearance, and pretty easy to depict – he’s just a Fire Giant waring a White Dragon pelt to eliminate his cold vulnerability. The figure looks fantastic, too, with some great detail work on that sword. 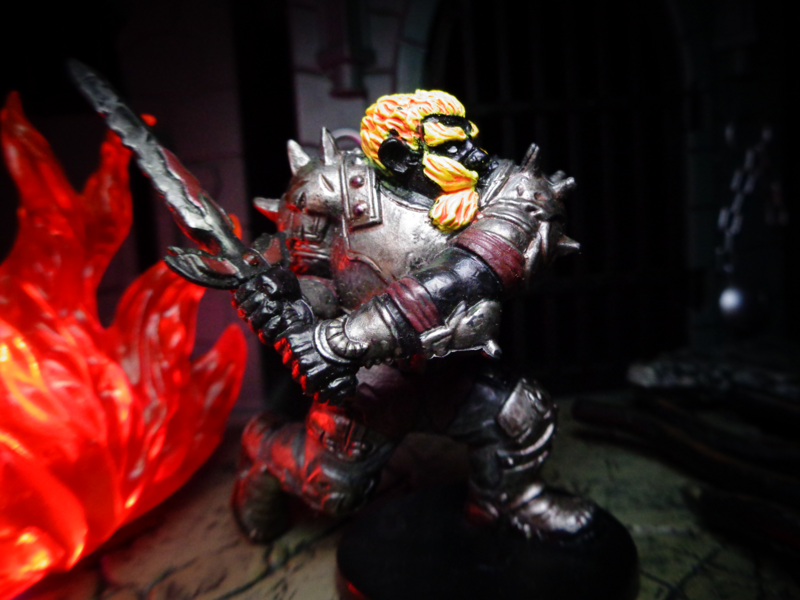 2006’s Blood War set gave us the Fire Giant Forgepriest, who is slightly larger than the others of his kind, as well as slightly darker hair in a ‘do reminiscent of the Heat Miser. Also, I have never seen one in person without a bent anvil-hammer. 4th Edition’s Against the Giants in 2008 (the minis set, not the adventure path) gave us the Fire Giant Raider, which has very odd facial proportions when you look from underneath. Otherwise, it’s as good as the others – Fire Giants seem pretty standard across the board. 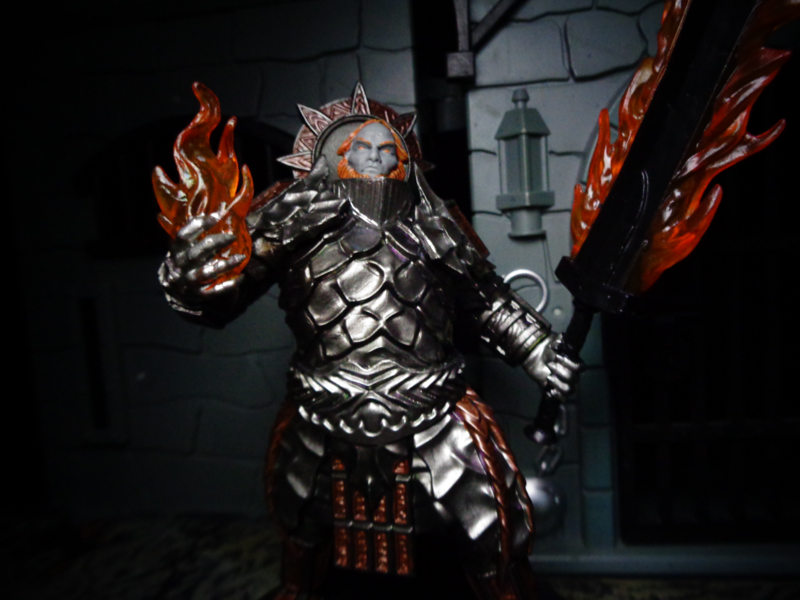 The same set also included a huge Fire Titan, which is pretty much Surtr, as outlined above. I especially like the faint orange paint wash on his body, giving him the illusion of being made up of burning coals. His fiery sword is also appropriately gigantic, looking capable of sweeping away entire villages. And then we have Pathfinder! 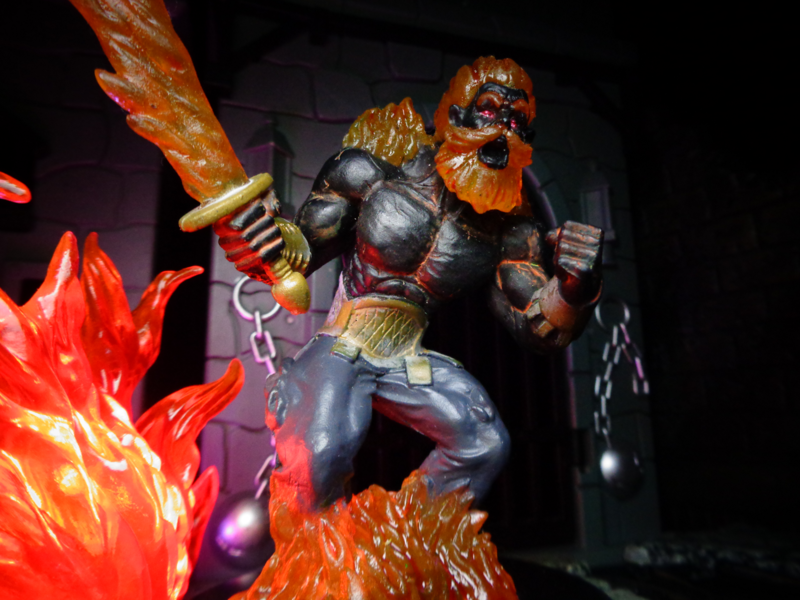 2013’s Shattered Star set included one Fire Giant, who looks like he’s made of lava! Seriously, the element is far stronger on Pathfinder’s version than the D&D rendition. He actually looks more like burnished bronze, straight from the forge! 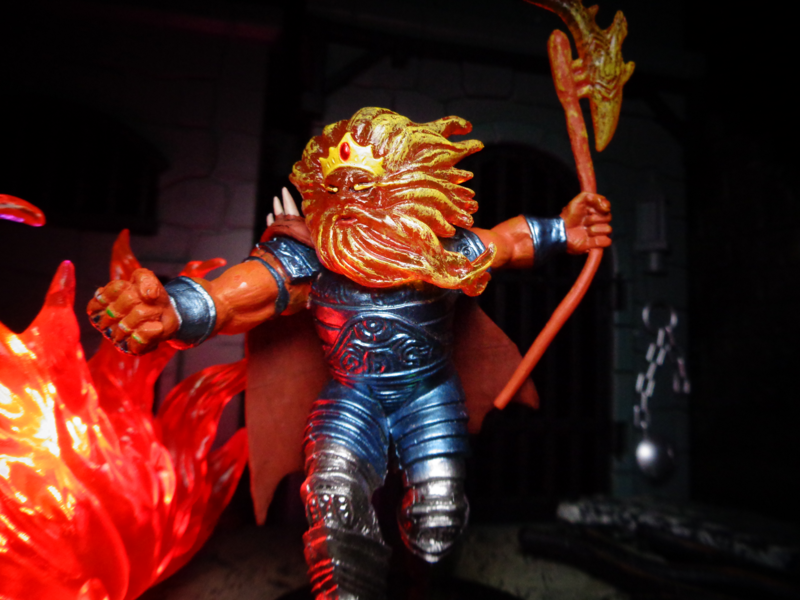 The Lost Coast in 2014 gives us the Fire Giant King, who not only uses some translucent plastic, and has a weapon that is always horribly bent, but he’s way too tall! Seriously, the Fire Giant King is about as tall as the Fire Titan, despite being officially one size category smaller. 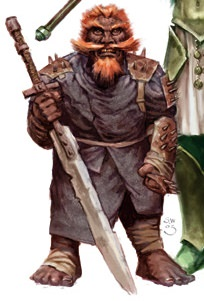 He does look rather regal and intimidating, as well as completely distinct from the other Pathfinder Fire Giant. Pathfinder has only produced those two, though, which paves the way for 5th Edition. 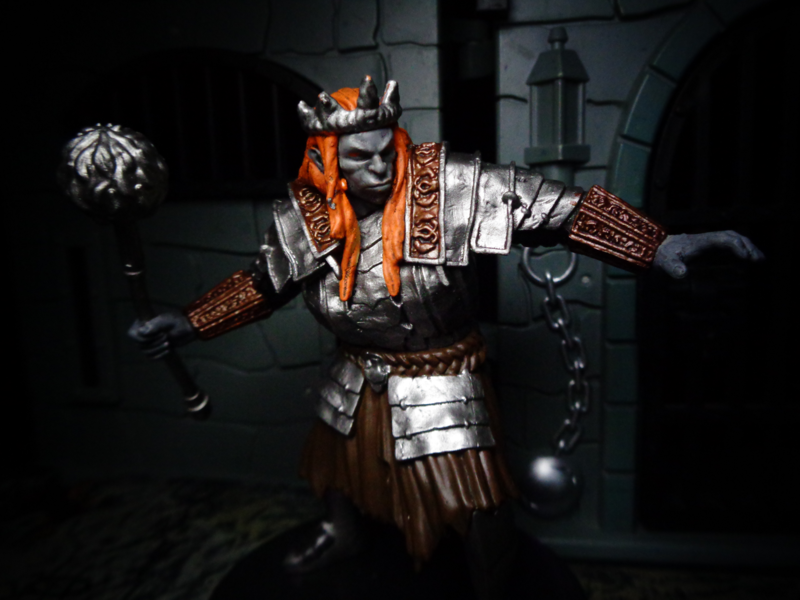 Our first female Fire Giant is Huge, and came in 2016’s Storm King’s Thunder set. She looks a lot like Brimskarda, wife of Duke Zalto and a character in the aforemntioned adventure. 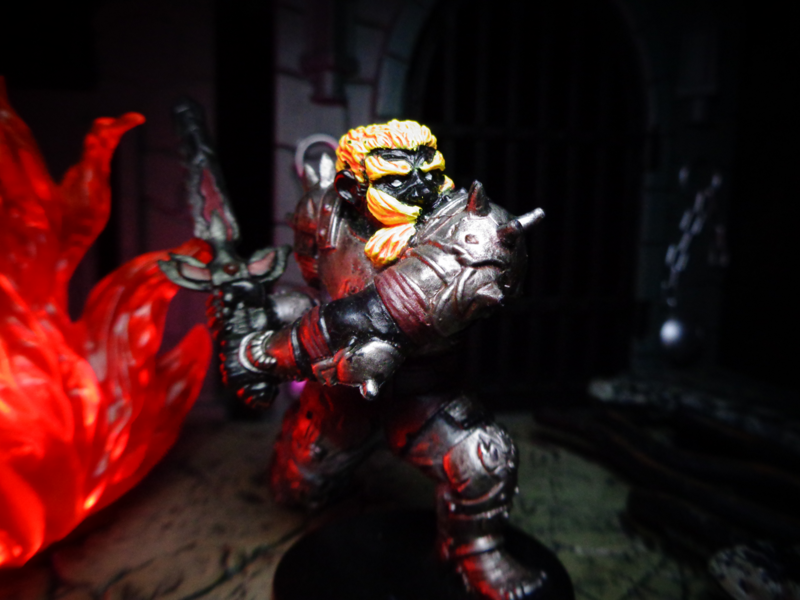 This figure comes with a weapon variant, too – with this one wielding a hammer. 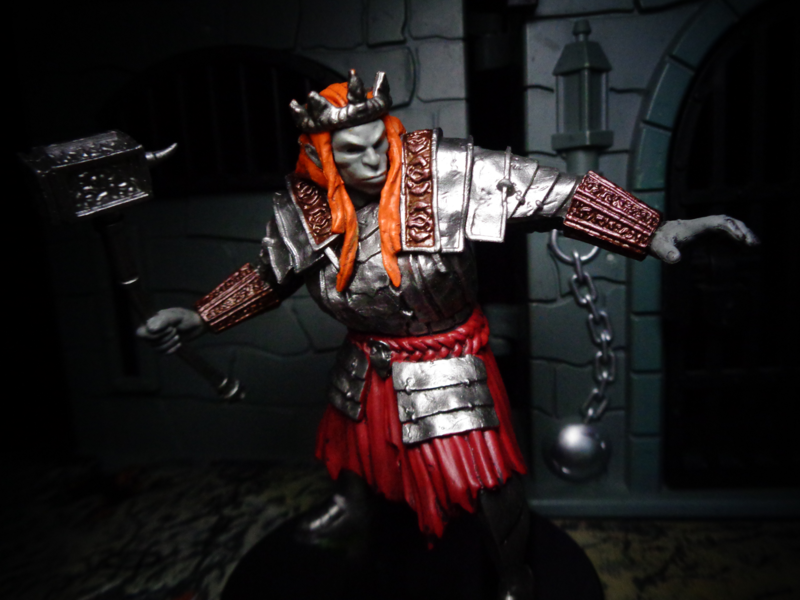 The other female Fire Giant wields a mace, and has slightly different colors. That’s about it. 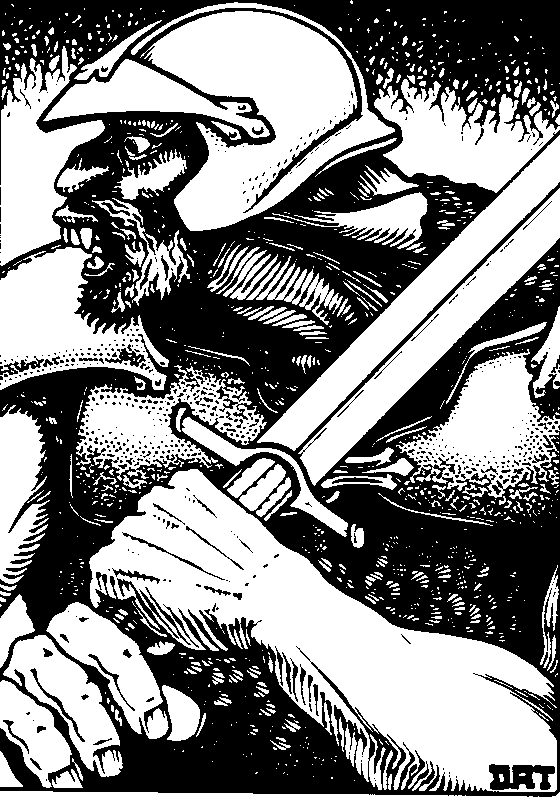 The third Fire Giant in the set (same name for all three) is very clearly Duke Zalto. Regardless of his unique-but-not-unique status, he really is Ganondorf. 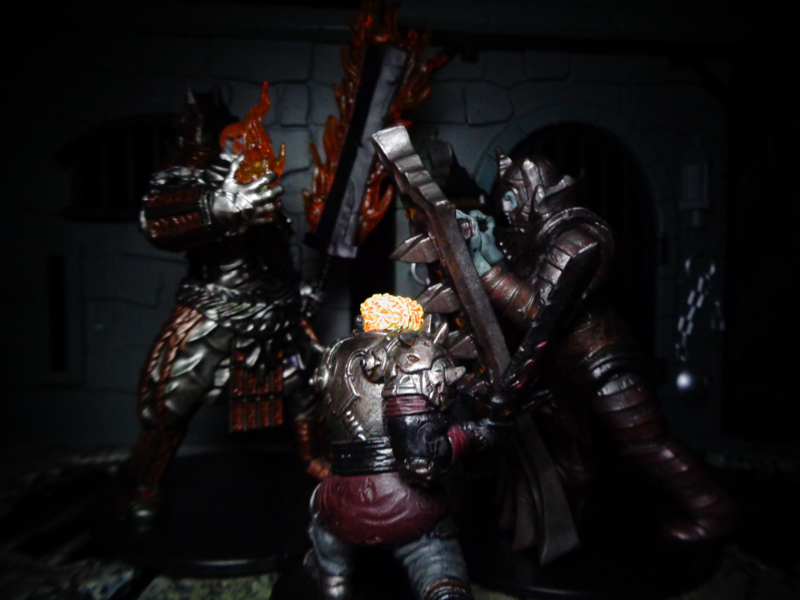 His massive fiery sword is actually packed separately, which is different from the Fire Titan’s. 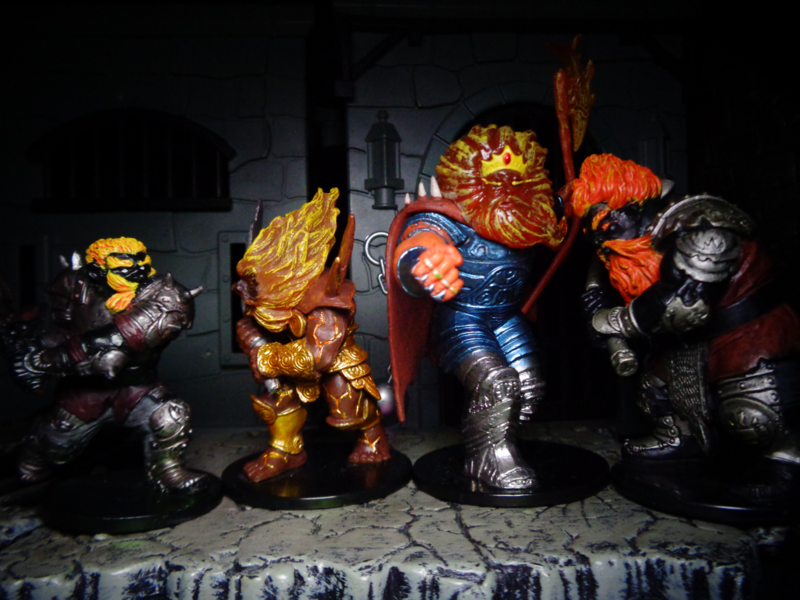 As cool as he is, this figure illustrates th gigatic shift in Fire Giant appearance between editions. And lastly, 2018’s Monster Menagerie 3 supplies us with the Fire Giant Dreadnought, a heavily-armored Fire Giant who wields dual spiked tower shields to basically be a bulldozer. This figure has the lightest skin of them all, and is essentially green. To be honest, without the label, there is nothing indicating that this is a “Fire” Giant – it could be practically anything. It just doesn’t fit in even with other 5th Edition Fire Giants. There is definitely size variance within the original four, with the Forgepriest and Raider being taller than the regular Fire Giant and Snurre. That said, the Forgepriest has the most bulk, and the first mini has the least. They are all relatively within scale of one another, too. 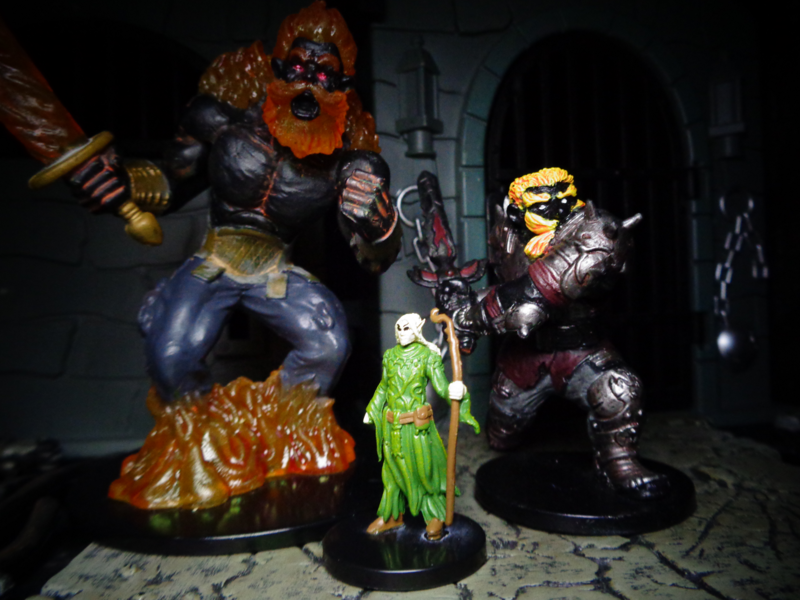 When you add the Pathfinder figures, it gets even weirder, with the regular PF Fire Giant being perfectly in scale with the D&D offerings, whereas the King dwarfs even the Forgepriest! It’s interesting how, although the Fire Titan is certainly quite big, he’s not that much taller than standard Fire Giants. Typically, one would expect the Titan to be even more titanic, but that’s just how it goes. 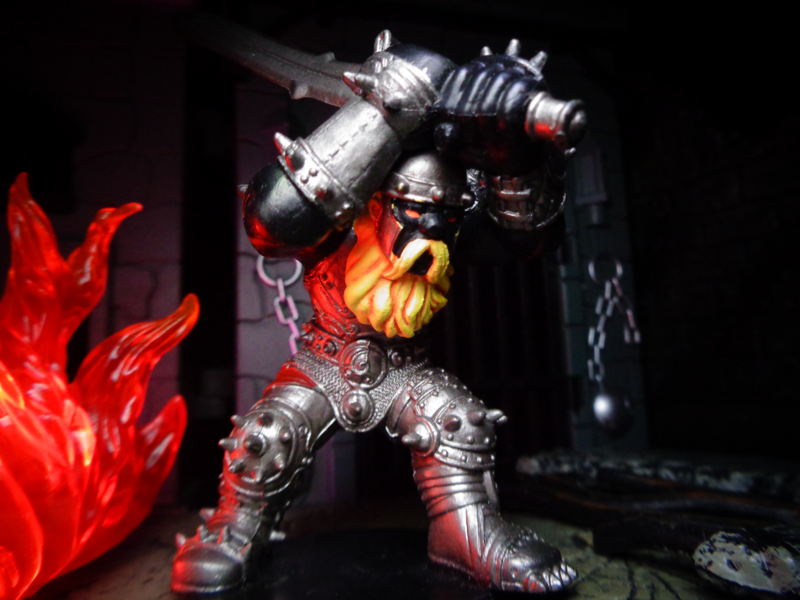 The 5th Edition version is taller than the Titan, and built in a much bulkier way – he dwarfs the other Fire Giants even more than the Titan! Essentially, the 5th Edition Fire Giants are to previous Fire Giants what the Fire Giants were to ordinary people. 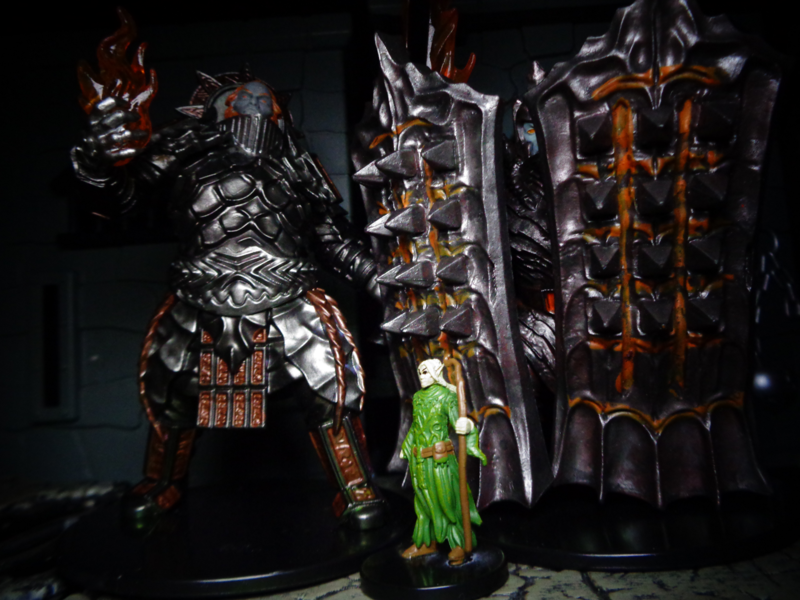 Although there is an obvious size difference between the Titan and 5th Edition giants, it’s within the range of normal variance – two people can easily differ that much in height. When it comes to ordinary humans, you can see clearly how Fire Giants may not be “huge,” but are certainly large enough compared to ordinary people to be considered giants. And of course, the titan even moreso! Meanwhile, those 5th Edition Fire Giants dwarf normal humans completely! Well, there you go! 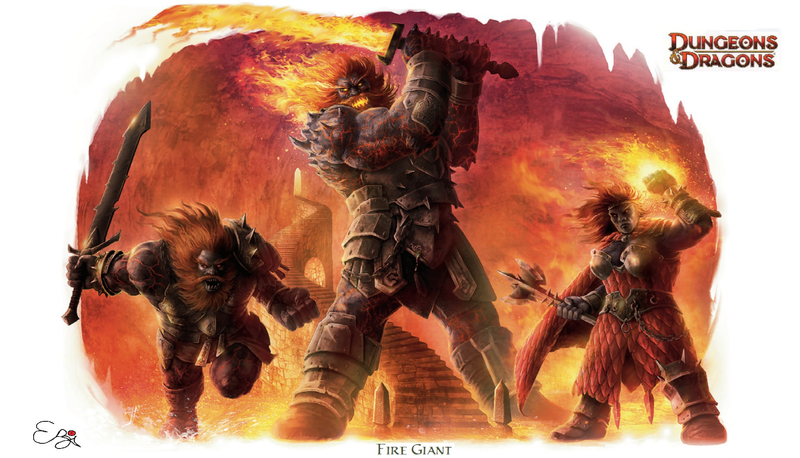 Although 5th Edition radically changed Fire Giants, the concept remains solid. Their particular color combination is surpriingly striking, and having a strain of giants who produce forged work is a welcome change from the club-wielding stereotypes that tend to dominate.